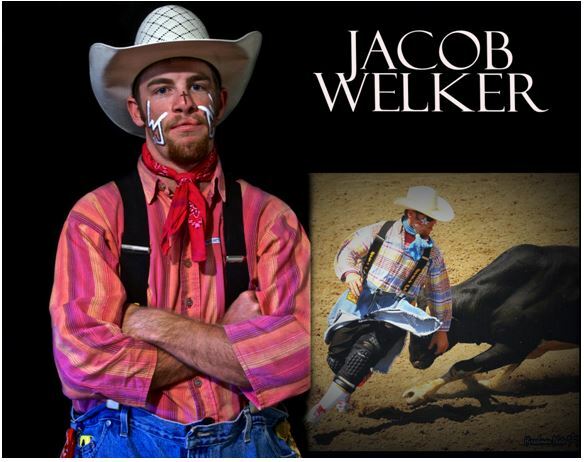 Chasing dreams and making them come true has been Jacob Welker’s passion for bullfighting and life. Welker, a native of Pretty Prairie, Kansas now in his early twenties is a PRCA card holder. His career highlights include working the Cody Nite Rodeo in Cody, Wyoming, both the Kansas Junior High and High School State Finals. Bullfighting Profession In his own words – This year he will travel to Minnesota, Nebraska, and Wisconsin working PRCA rodeos. He wants to work the Wrangler National Finals Rodeo in the future. Face paint – His initials JW and the “I love you” symbol in sign language for his grandmother. Favorite childhood book – Go, Dog, Go by P.D. Eastman.